Spring has finally progressed far along enough that I have some subjects for my ultraviolet-sensitive camera. Many flowers have ultraviolet (UV) nectar guides. Nectar guides are patterns on the flower petals that are only visible to animals that can detect ultraviolet light with their eyes, typically pollinating insects. The darker sections tend to be in the center, where the nectar is. In the featured side-by-side example, I have the same dandelion flower taken twice. I like the side-by-side composite photograph here because the differences are most striking when one can compare alternate spectra directly with the “normal” version. The first, on the left, is taken with an unfiltered full-spectrum camera. The color of the grass is odd because of the infrared contamination. However, the dandelion itself is pretty close to the normal visible color. 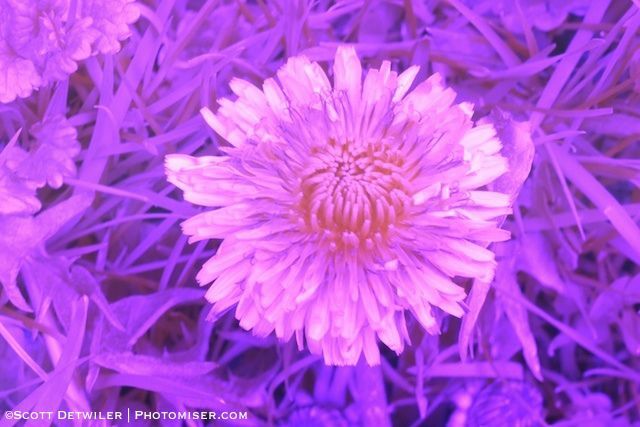 On the right is the same flower, but with an ultraviolet filter in place. 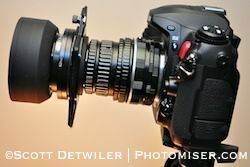 I use a 75mm f/4N EL-Nikkor lens on extension tubes, on a Fuji IS Pro UVIR-modifed camera. The EL-Nikkor passes UV better than normal lenses, which are specially designed not to pass UV. I use an “Andrea-U” UV-pass filter, designed for astro-photography. (Baader makes a similar filter called “Venus;” note that most other available UV-pass filters leak a significant amount of IR light, make them unsuitable for this type of photography with a full-spectrum camera like the Fuji IS Pro.) The camera does attempt to meter through the lens but it ends to underexpose significantly even set to its maximum +5.0 EV. The P setting got me in the ballpark, then I used the Manual setting to bracket to a good result; about three more stops seemed to do it. The exposure in the final UV image was 5 seconds, ISO 1600. I have the aperture set to f/11 to use depth of field to compensate for differences in the focus points between the visible and UV spectra. Post-processing is a key step of invisible light photography. We are working with color that does not exist as far as our brain is concerned. So, post-processing becomes a function of the goals of the photographer. In this particular case, I wanted to have some reference to the dandelion-yellow present in the visible spectrum. Otherwise, it can look too false, like a visible-light image simply colorized in Photoshop. I also got the side benefit of retaining some semblance of green in the grass. To the left I have posted an alternative version that favors a pink cast. Unless the camera is adjusted, ultraviolet photographs tend to come out of the camera with a strong purple cast. The best way to get away from the purple case is to adjust the white balance. And the best way to adjust the white balance is to shoot RAW, and adjust the white balance at the computer. One can also set the white balance in-camera, but I have not had much luck with that yet in mine. The balance setting is so extreme that the camera menu just does not want to go there; even auto-setting white-balance with a UV-neutral object did not work for me because the filter lets so little light in that the white-balance indicator would just show an error. If you do manage to set the white balance in camera, you get the advantage that the captured images displayed by the camera’s LCD give you a better idea of what you’ve done. RAW is also better because it retains all possible light information the camera has captured, which gives more flexibility in post-processing. For example, you can set the white balance to anything you want regardless of where the camera was set. For the yellow-cast UV image, I started with a white balance set for infrared, for which I also use this camera; that’s what it happened to be, and I was not relying on the camera’s white balance for the final image. The jpeg previews come up very red-purple; however, that was sufficient for adjusting framing and focus. I had the camera create a RAW+JPEG image pair. Aperture is my preferred cataloging and post-processing software. Unfortunately, it will not recognize Fuji IS Pro’s RAW format, and even if it did, Aperture has no white-balance adjustment. Nor will OS X’s Finder preview these images for me. I use the JPEG to see what images look promising. Then I import them into Gimp using the ufraw plug-in. The ufraw plug-in allows me to adjust white balance all I want. In the case of the UV image on the right, I selected ufraw’s auto-white-balance, and that gave me the yellowish flower and greenish grass. I then sent it to Aperture for some final adjustments, since I am more familiar with that than Gimp. 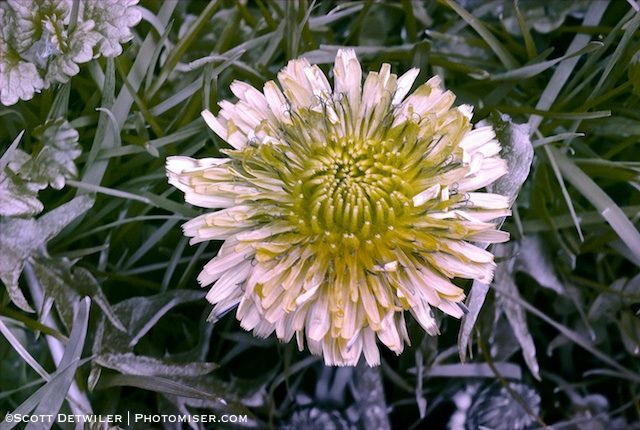 This entry was posted in One Picture a Day, Photomiser Gallery, UV IR Photography and tagged Fuji IS Pro, Ultraviolet.